This cat shedding #shedhappens post is sponsored by Swiffer. Opinions are my own. Remember in Rudolph the Red-Nosed Reindeer when they traveled to the island of misfit toys to pick up all those unwanted and broken toys and find them homes? Well, my house is the island of misfit cats because it seems as if all the misfits and tougher-to-adopt rescue cats sucker their way into my heart and home. I can’t resist the unwanted, the returned, the troublemakers… and I wouldn’t have it any other way. I adore them, and want to save them all! But whenever I love on one of my fur babies (approximately every thirty seconds) it results in a fresh tuft of cat hair taking to the skies, and that drives me bonkers. In fact, it’s one of the biggest reasons I waited so long to adopt any pets. Did you know 58% of Americans own pets and agree that controlling pet hair in the home is a top concern? The joke’s on me because I have four rescue cats, and the #shedhappens every stinking day of the year. It’s especially horrific right now since they’re losing their winter coats, but I love them so ding dong much that I deal with their furry messes. The key to dealing with pet hair is to keep up with it. 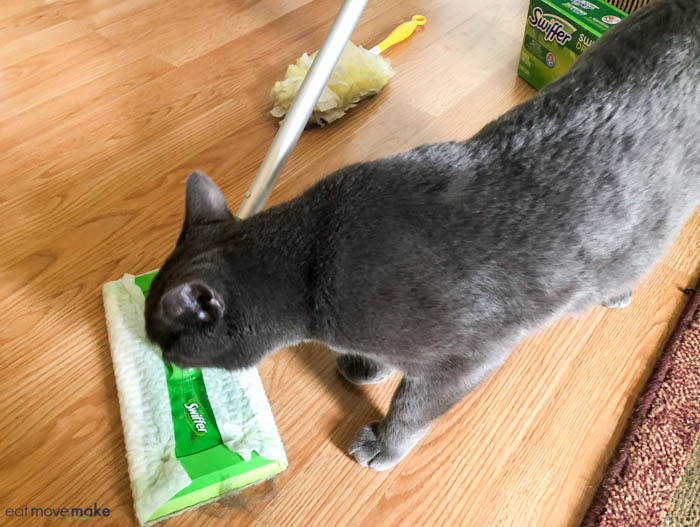 A little daily maintenance goes a long, long way in preventing massive amounts of build-up, so I keep a Swiffer Sweeper nearby and whoosh my way to fur-free once a day! 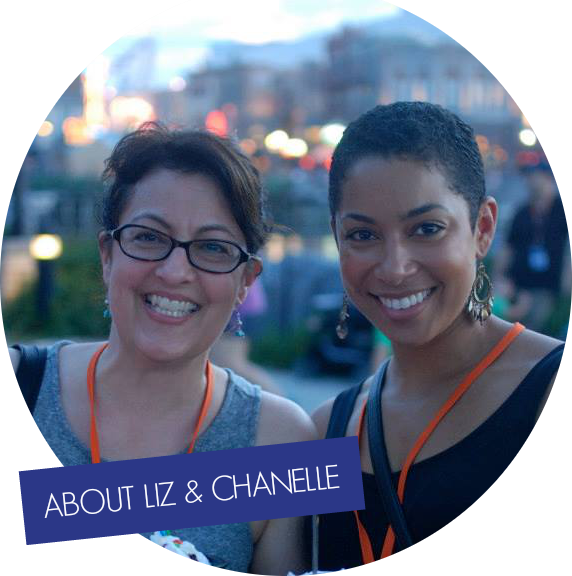 It’s especially important to me to keep my house clean because I do so much cooking and baking. I prefer cat hair not be listed as a recipe ingredient. 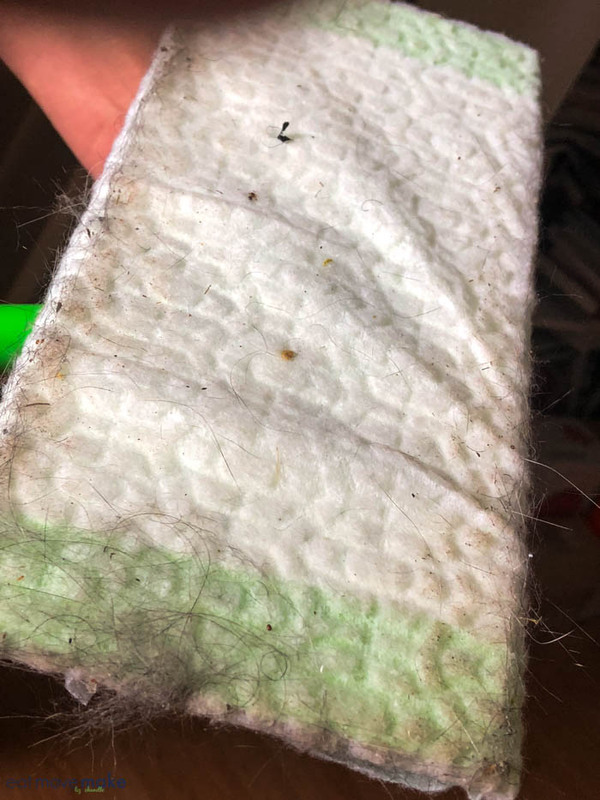 I do my daily Swiffer-ing with dry pads, but twice a week or so, I use the wet pads to remove any other sticky grime and debris on the floors. 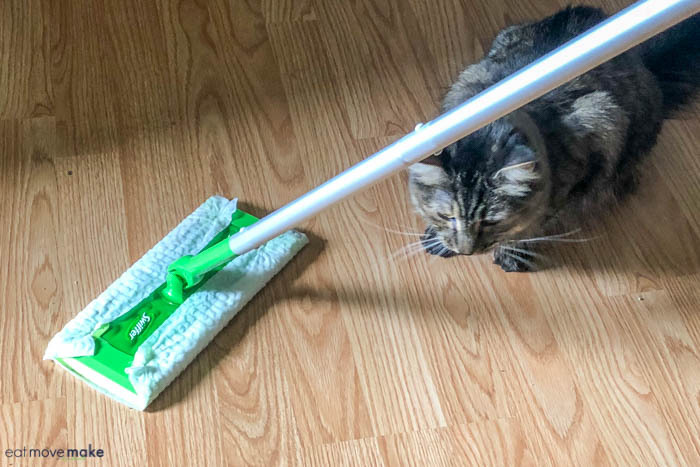 I also use my Swiffer Duster (which Dexter knocked on the floor in the below photo) every evening to sweep along the window ledges where the cats hang out. 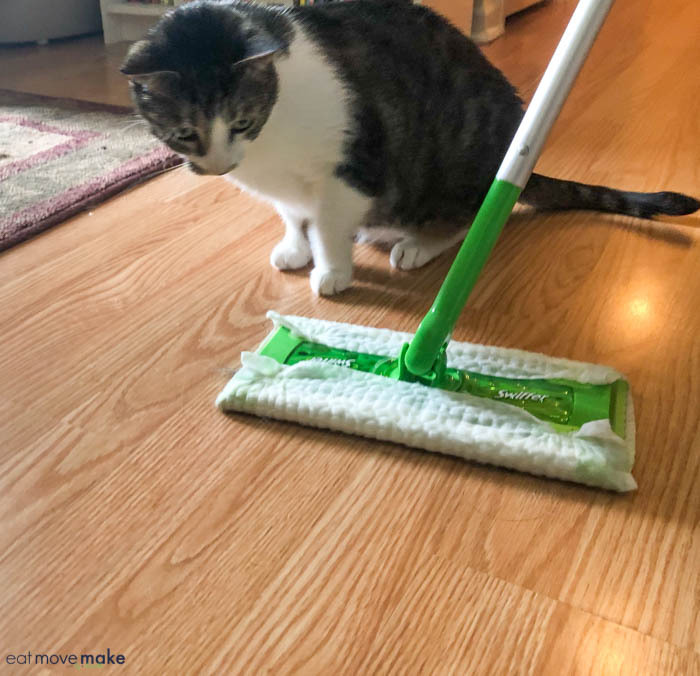 I love Swiffer Dusters because they fit into every nook and cranny and pick up all the dust, dirt and cat hair lurking and hiding. I’m on to this guy’s tricks. No judgment; he’s looking for tidbits of kibble I swept up along with the fur. While I’ll never be one to dance while I’m cleaning, I really don’t mind scooting around with a Swiffer for a few minutes a day. It works great, which means less time spent on my once-a-week deep cleaning and more time spent playing with my kitties. Visit Swiffer.com for more info on Swiffer cleaning products or connect on the Swiffer Facebook page. Need to pick up the shed in your life? Use this coupon code (https://cartwheel.target.com/search/swiffer ) to get your own Swiffer Sweeper! I don’t have a cat but I have thick, long hair that gets everywhere. I really need to try this Swiffer on my hard wood floors. I’ve heard of dogs having this problem as well. Swiffers do the job for sure. We have a Swiffer and it does pick up a ton of hair. We have a cat and an Austrailian Shepherd that sheds like crazy! I hear you when it comes to pet hair. We have a dog and a cat and it’s everywhere. I’ll need to try a Swiffer on my floors. No cats here, but we have a friend that has two cats and fights this all the time! Cat hair is the worst! Cat fur can be so hard to clean. Ugh! I will definitely look into getting a Swiffer Sweeper. One of my cats sheds a lot more than the other and I do feel like I am constantly cleaning up cat hair! I love my swiffer…it really does make the work easier. I first had a Swiffer in college and it made things so much easier! Good call for using it with pets. Swiffer is definitely a staple for any household. We use ours on the daily and it helps a lot for toddler messes. I have two cats, and the shedding can get bad. I love my Swiffer products as well. They really do work very well. I have a Swiffer and I love it. I don’t have cats, but I have two dogs who shed all over the place. It’s awesome for picking up their hair.